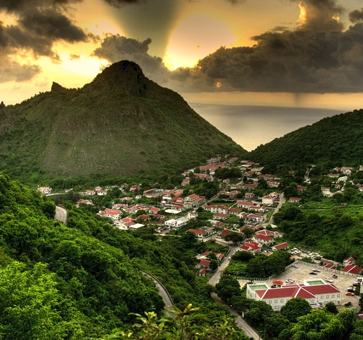 Welcome to Saba, the Unspoiled Queen! The Dutch island of Saba is a refreshing change from the cosmopolitan hustle and bustle that St Maarten and St.Barts provide. Named the Unspoiled Queen, she is an eco paradise and quite the getaway for avid divers, hikers and nature enthusiasts. The island of Saba rises majestically from her clear azure waters, stretching her summit to caress the clouds… She is like no other Caribbean destination. Untouched by the quickening pace of the modern world, an island caught within a moment…. and the moment within which she’s captured you ask? 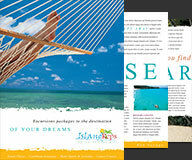 The old Caribbean; safe, friendly and charming with exquisite natural beauty both above and below her waterline. Take a daytrip to this mystical mountain island. Join our lunch and taxi tour package if hiking won’t be a big part of your day… taxi tour and lunch at Scout’s Place included. At every turn of the road is a spectacular view. Quaint shops in Windward side sell local crafts such as the handmade Saba lace, Saba Spice Liqueur, hand blown glass jewelry, and artwork. Hikers can choose a guided hike or buddy up for the wondrous walk up Mt. Scenery with a picnic lunch in the rainforest. Scuba Diving in Saba is world renowned. 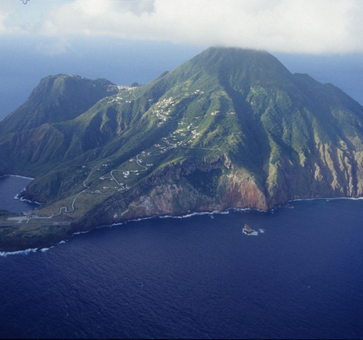 Many divers will ensure that a day trip to Saba is part of their dive vacation plan. Novice divers are encouraged to dive a few dives in St Maarten before venturing over to Saba, as the wall and pinnacle diving can be considerably deeper. Certification cards are required for all divers.